Sarin has met its greatest match: Water + Bleach. The first of Syria's chemical weapons have left the country, and are en route to their destruction. Piled aboard a Danish ship, they're headed to Italy, where they will meet a U.S. Navy ship outfitted with equipment to destroy the weapons. How much of the Syrian stockpile has been removed remains unknown. 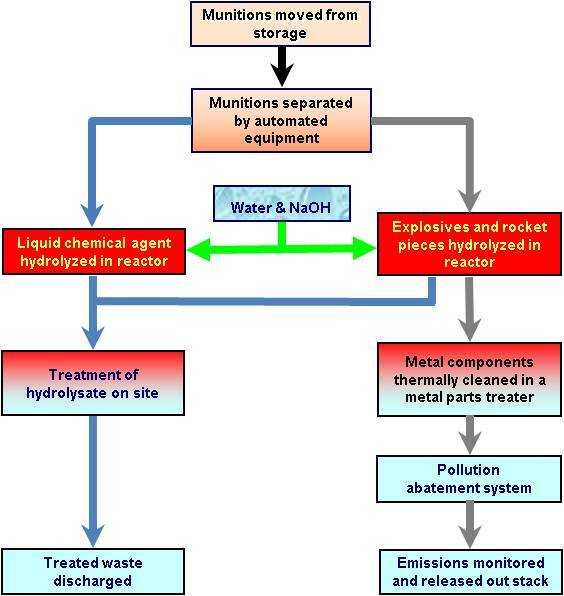 The most commonplace of chemicals, water, can destroy the weapons, in what is called a hydrolysis reaction. If you took high-school chemistry, you have conducted a hydrolysis reaction (come on, you remember, right?). Hydrolysis works like this: When water — either acidic or basic — is mixed with certain chemicals, the water will act as a knife, slicing those chemical in half. In the case of chemical weapons such as sarin gas and VX, they are broken down into simpler units without such violently toxic effects. As National Journal's Sara Sorcher reported in December, the U.S. military has a mobile hydrolyzer that it will employ on the ship. This is what it looks like. The military boasts that this machine is 99.9 percent effective at neutralizing chemical weapons. But what's amazing is that the chemicals it uses to prime the water for chemical destruction are ones you can find at home. "Water, sodium hydroxide (NaOH) [also known as lye] and sodium hypochlorite (NaOCl) [bleach] are required for neutralization of chemical warfare material and decontamination of system components," the Army's press materials state. The waste that results, which still might contain some nasty chemicals, can then be stored for later disposal. Officials told Sorcher in December that the waste will not be dumped into the ocean. The simplicity of the system doesn't mean you should try this at home. Much of the engineering complexity in the hydrolyzer serves to protect the technicians who use it from the untreated chemicals. (CDC)The United States is good at destroying chemical weapons. We, after all, also signed the Geneva chemical-weapons treaty and destroyed our own stockpile. This flowchart from the Centers for Disease Control and Prevention summarizes the process well. Click to make it bigger.